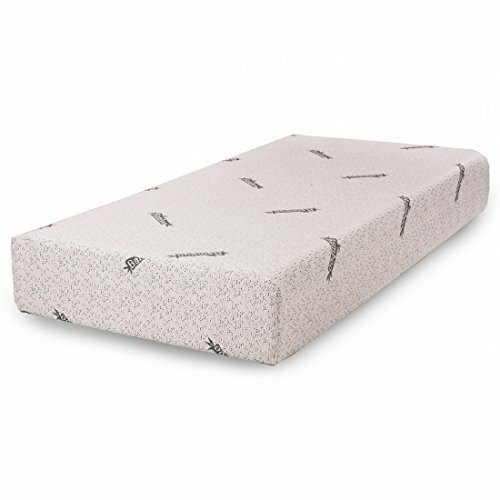 The mattress encompasses the comfort of memory foam, minimizes pressure on the body and provides balanced support. Within minutes, it creates a perfectly personalized and balanced form around the body. -Layer one: 1.5"" ventilated bamboo charcoal air cell technology memory foam top layer provides better ventilation and disperses body pressure. It can absorb harmful gas in the air, release far-infrared rays and anions by the absorption of charcoal heat, so to ensure effect of long lasting constant temperature on the mattress. Benefit from the adsorption and purification functions of the top mattress bamboo charcoal layer, it can absorb the gas that human body exhausts during sleep and can also update the air over the mattress constantly. -Layer two: 2"" blue gel memory foam eliminates motion disturbance, so you will sleep right through your partners nighttime tossing and turning. outer cover: Poly-jacquard fabric with bamboo fiber ensures you feel cool and comfortable throughout the night. Careful construction guarantees no prohibited phthalates, ozone depleters, CFCs, mercury, formaldehyde, PBDEs, and low emission (VOCs) for indoor air quality. This mattress does not contain synthetic or natural latex of any kind. Themattress is efficiently compressed, rolled and shipped in a box conveniently to your door. If you have any questions about this product by Cr, contact us by completing and submitting the form below. If you are looking for a specif part number, please include it with your message.